I personally would want to try braids But i feel like it would look strange on me. But I really love them on the Singer from Straight line stitch. In at least two music videos of her that Ive seen She has this firey looking set. And In another its just this wonderful shade of Neon Orange. Oh yeah, I remember that band, they have pretty good songs, IMO. Anywho, if you are little apprehensive about about wearing braids in particular that have a plentiful of bright colors throughout your head, why not try out first all natural colored braids in your hair? So try it out! It would be great to post your progress with this! Good luck! Rae_Bella wrote: Oh yeah, I remember that band, they have pretty good songs, IMO. Anywho, if you are little apprehensive about about wearing braids in particular that have a plentiful of bright colors throughout your head, why not try out first all natural colored braids in your hair? Yeah but I'm gonna try and go for white. 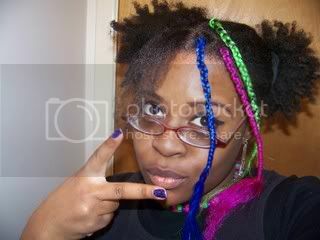 But I don't have the money right now So I'll end up putting in whatever dreads suit my hair which right now is a mess. lol I figure white and blacks Grey when I get around to the braids. I like it! Would love to have seen the full look. I haven't done dreads in awhile, and am thinking about doing some twists and braids, just to see how I like it. I'm growing my hair out and I want to try to something that I can leave in for awhile that protects my hair while it grows, that doesn't need to be secured so much with rubber bands. Even the "ouchless" ones are damaging to my strands sometimes.